Mike Bounds Towing & Recovery has the largest fleet of tow trucks in The Big Country and West Texas to help you quicker in case of a big rig accident. Our trained tow operators will be there in a moment’s notice to help you with heavy duty towing, recovery and storage following a break down or accident. With over seven decades of combined experience and 24-hour towing availability, we are the number one heavy duty tow truck company in the Abilene, TX area. Call us today for quick assistance. It happens to all of us. One minute we are driving down the road and the next our hazard lights are lighting up like the 4th of July! Don’t fret, our team at Mike Bounds Towing & Recovery will be there in no time to help. 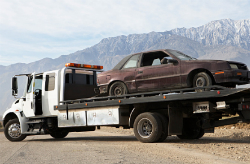 We have the largest fleet of tow trucks in West Texas to come and help you whenever you need a quick tow. Call us when your car breaks down and we will be there as quickly as possible! Our team does it all. We provide storage services for your heavy duty trucks, too! If you have nowhere to keep your heavy duty vehicle while you wait for a repair company, we will be happy to store it at our facility. Mike Bounds Towing & Recovery will gladly store your RV’s, buses, tractor trailers, big rigs and more after a breakdown or accident. Call us whenever you need us! Nothing worse than having a charter bus broke down on the side of the highway. The first company I called said no, but Mike Bounds Towing & Recovery rescued me. - Troy S.
Mike Bounds Towing & Recovery arrived at the scene of my accident fast. I had a few questions concerning costs and process. The driver was friendly, professional and took time to answer my questions. Mike Bounds Towing & Recovery is the only company I recommend. - Parker H.